Cost is minimal – All you need is one disc to play and a disc only costs about $15. 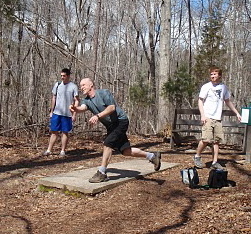 There is no green fee or charge to play a disc golf course. Now admittedly most serious DGers have a bag full of discs but still for under $100 you can get years of play in. Contrast this with golf golf where an average green fee is around $50 for one round. Takes about an hour – When I played the other kind of golf it was at least a half day event. 4-5 hours for a round was minimal. I can play a round of DG in about an hour if I am playing with one other person – 40 minutes if I play by myself. Good exercise – Everybody says that walking is good exercise. The course that I generally play on has some hilly terrain so I feel like I am exercising when I play. I had gotten to the point where I almost always rode a cart with golf golf – not much exercise in that. Fun way for guys to hang out – Guys don’t do good just sitting down over coffee and talking. They need to talk while being distracted by other stuff so that they don’t feel like they HAVE to talk. This is the great thing about DG. Guys can play together and find out about each other’s lives without the pressure of trying to keep a conversation going. Hole in one – I played golf golf for 40 years and not once did I ever have a hole in one. 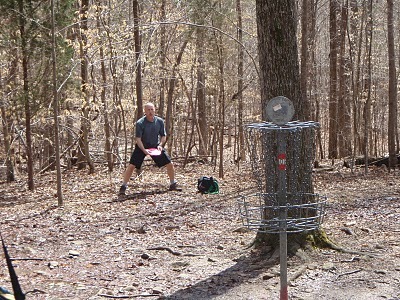 I have been playing DG for about a year and already I have one hole in one under my belt. Pretty thrilling I must say. My sons enjoy it – All 3 of my sons enjoy the game and we have a good time playing together. We actually started an annual Reyner Christmas Championship – Scott is the reigning champion. I can be competitive – When I first started playing I would shoot about +18 for a round. Now I expect to be par or better. My best score to date is -5. And I feel like I can beat anyone I play I with on any given day. It usually doesn’t work out that way but at least I feel like I have a shot. Not bad for an over 50 guy. Close to home – My home course is only 7 minutes away from my house. I love the fact that I can be at the course so quick. Play year round – I would never play golf golf if the temperature was under 45 degrees. I can play DG all year. Last year I was out playing when it was 22 degrees. Just throw on a couple layers of clothes and I’m good to go. Gives me something to ask for for Christmas – I never know what to ask for for Christmas or my birthday. Now that I’m playing DG I can always ask for a new disc that I want to try out. It’s something I will enjoy and an inexpensive gift for someone to buy. So there you have it. So if you are reading this and have a sudden hankering to try the game out then give me a call. I’d love to get in a game with you and show you why its such a great sport. I’m reading a book by RC Sproul called The Holiness of God – considered to be a modern day classic. He introduced me to this term that I used for my blog title and I was intrigued by it. Mysterium tremendum et fascinans (“fearful and fascinating mystery”) is a Latin phrase which Rudolf Otto uses in his book The Idea of the Holy to name the awe-some (fascinating and full of awe) mystery that was the object common to all forms of religious experience. Essentially it is the term he used to describe God’s holiness. I know that I have not encountered the holiness of God as Isaiah did. I know that I need to. I need to be gripped by the fearful, fascinating, mysterious God who reveals Himself as The Holy One! I’m pretty sure that until I am I will never have the kind of walk with God that I want nor the kind of influence in ministry that I desire. Still another way for you who are reading this to pray for me. So here are a few pics from the birthday get together last night. We met at Chili’s at Triangle Town Center in Raleigh. (By the way, in case you are not aware of what the birthday boy’s plans are – he is in the 2+2 MDiv program at Southeastern Seminary and hopes to be overseas in a few years.) We had a great time. Linda and I are still getting used to relating to our kids as adults and not as children. But we are enjoying the learning process. It is appropriate that the first post on this blog falls on my son’s birthday. Scott is 23 years old today. Tonight our family will celebrate with him at Chili’s in Raleigh. Always fun to get together with the 6 of us. It seems that it happens less and less now that everybody is pursuing their own lives. I am very blessed to have a wife, 3 kids, and a son-in-law who all love God and are following after Him and seeking to live God honoring, gospel centered lives. You have always made choices based on what you want to do and what you believe God wants you to do. You have never tried to be a people pleaser. I am amazed at your discipline. When you decide to do something you give it your all. I am also amazed at your hunger to know God and His Word. Your thirst for knowledge puts me to shame. You have a great sense of humor – I especially notice it in your tweeting. “14For this reason I kneel before the Father, 15from whom his whole family in heaven and on earth derives its name. 16I pray that out of his glorious riches he may strengthen you with power through his Spirit in your inner being, 17so that Christ may dwell in your hearts through faith. And I pray that you, being rooted and established in love, 18may have power, together with all the saints, to grasp how wide and long and high and deep is the love of Christ, 19and to know this love that surpasses knowledge—that you may be filled to the measure of all the fullness of God.